LOS ANGELES (AP) — The Los Angeles County inspector general is investigating whether sheriff’s deputies racially profiled drivers when they stopped thousands of innocent Latinos in search of drugs on a major freeway, the Los Angeles Times reported Monday. The investigation began after the newspaper reported that 69 percent of drivers who were stopped between 2012 and 2017 as part of an enforcement operation on Interstate 5 were Latino. Two-thirds of the Latinos stopped by the Los Angeles County sheriff’s Domestic Highway Enforcement Team had their cars searched, a rate far higher than other racial groups, the newspaper reported. County Supervisor Hilda Solis said the report “warrants a deeper investigation” and asked the inspector general and a civilian oversight commission to review the enforcement team, made up of four white male deputies. “It’s deeply concerning that racial profiling could have been used on Latino drivers,” Solis said in a statement. Officials with the sheriff’s department have denied racial profiling and say they stop people based on their driving and other impartial factors. Sheriff Jim McDonnell said he’s proud of the team’s work, which includes seizing 3,500 pounds (1,588 kilograms) of drugs and rescuing six victims of human trafficking. “As someone who has dedicated my career to protecting the civil rights of all people, I am personally concerned about any allegation of racial and ethnic profiling and take very seriously questions about race and police procedures,” he said. Inspector General Max Huntsman declined to comment on the scope of the review or how long it would take. 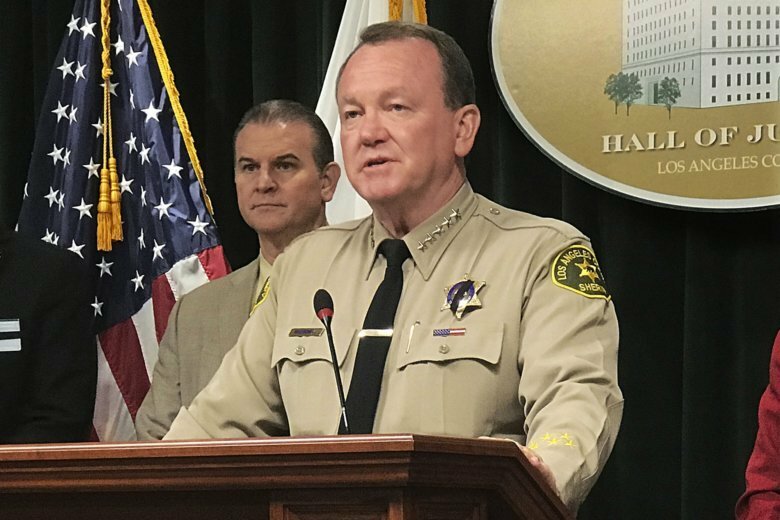 Sheriff’s officials said the enforcement team was formed in response to a rash of drug overdoses in the Santa Clarita area. The team’s four deputies typically work alone in marked SUVs in an area of Interstate 5 that spans roughly 40 miles (64 kilometers) of freeway from just south of Santa Clarita to the border with Kern County. The freeway, deputies say, is a pipeline for cartels to move drugs up the West Coast and return to Mexico with cash and guns. Analyzing data from every traffic stop recorded by the enforcement team from 2012 through the end of 2017, the Times found that 69 percent of the 9,000 stops were of Latino drivers. And while two-thirds of those drivers had their vehicles searched, cars belonging to all other drivers were searched less than half the time. The Times reported that deputies found drugs or other illegal items in the vehicles of Latino drivers at a rate that was not significantly higher than that of black or white drivers. On the same section of freeway, California Highway Patrol officers pulled over nearly 378,000 drivers for traffic violations, and 40 percent were Latino. Lael Rubin, a member of the Sheriff Civilian Oversight Commission and former supervisor in the district attorney’s office, said she was “horrified” by the numbers and expects the commission to discuss the issue when it meets next month. County Supervisor Kathryn Barger, whose district includes the stretch of freeway patrolled by the sheriff’s team, praised the unit’s efforts to remove drugs and help victims of human trafficking. “However, no innocent individuals should be subjected to unreasonable targeting or unconstitutional search and seizure,” she said.